At noon ET today, Feb. 8, the United States Mint introduces a small proof coin for collectors, the 2018-W $10 American Liberty minted in 1/10-ounce .9999 fine gold. If the coin’s imagery looks familiar, that’s because it first appeared on last year’s larger 2017-W $100 American Liberty High Relief 1 oz. Gold Coin. It debuted in April 2017 for $1,640, scoring first-day sales of 14,285 coins. The new smaller $10 coin, priced at $215*, is offered as a more affordable option to last year’s coin. These two CoinNews photos show the obverse and reverse of the 1-ounce, 2017-dated American Liberty gold coin. The collectible is still available today, now at $1,740, with sales of 27,644 coins. This year’s edition is a smaller version, minted in 1/10-ounce gold. 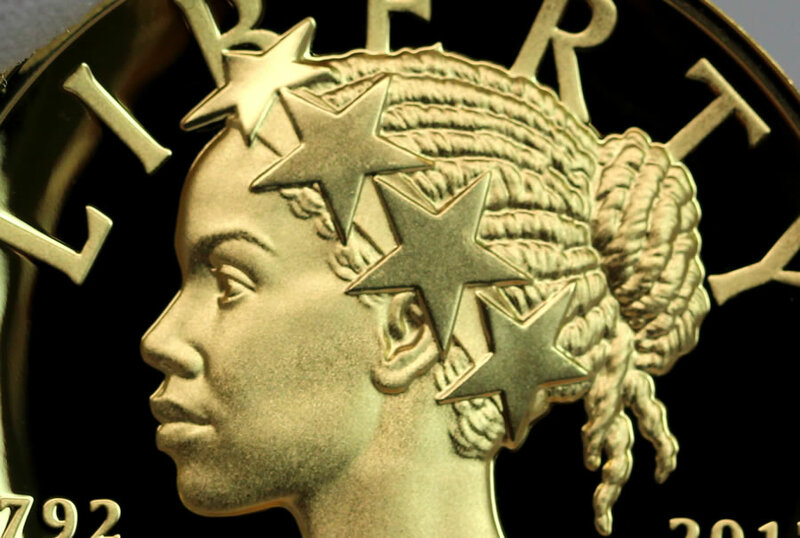 Designed by Justin Kunz and sculpted by Phebe Hemphill, coin obverses depict Liberty as an African-American woman wearing a crown of stars. The crown pays homage to the bronze Statue of Freedom topping the dome of the U.S. Capitol. 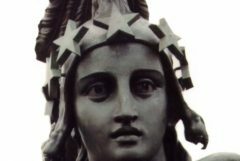 Inscribed around the allegorical figure are "LIBERTY," "2018," and "IN GOD WE TRUST." The design marks the first in a series that will feature Liberty in a variety of contemporary forms to reflect the cultural and ethnic diversity of the United States. The next Liberty design is expected in 2019. Reverses (tails side) of the 24-karat gold coins show a powerful eagle in flight design that is surrounded by inscriptions of "UNITED STATES OF AMERICA," "E PLURIBUS UNUM," "1/10 OZ. .9999 FINE GOLD," and "10 DOLLARS." Chris Costello designed the eagle and Michael Gaudioso sculpted it. 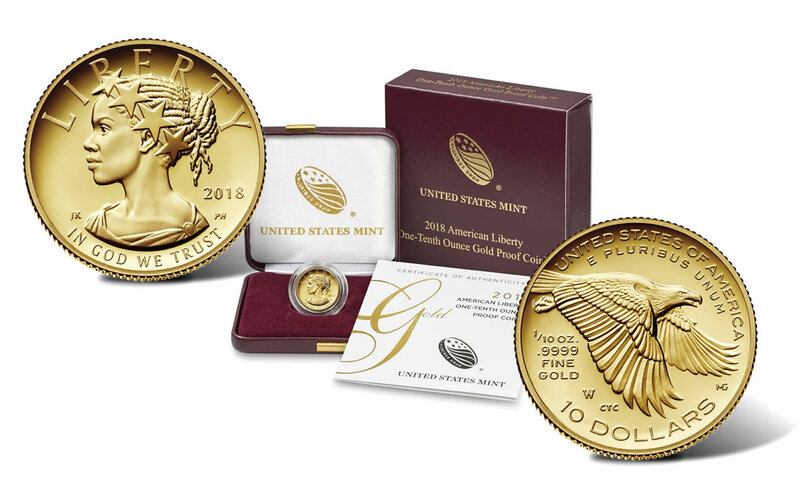 Order the collectible by visiting the U.S. Mint’s webpage for gold coins, located here, or by calling 1-800-USA-MINT (872-6468). Its mintage is limited to 135,000 pieces. There is a further restriction of 5 coins per household. *Pricing of gold coins can be adjusted weekly depending on market conditions. (See the U.S. Mint’s gold coin pricing schedule.) Current gold coin prices are based on LBMA gold that is within $1,300.00 and $1,349.99 an ounce. First-day sales of the $10 American Liberty reached 9,842 coins, U.S. Mint spokesman Michael White told CoinNews in an email Friday, Feb. 9. Charlie 1952: I agree on the packaging / presentation quality issue. I purchased one too earlier this year as well. Got my coin today, what a beautiful design. When I get my graded proof 70 ultra cameo in the mail I’m going to give the proof coin to my pop for his collection. Looking forward to the next design. When it comes to the packaging, it’s at par with my Royal Canadian Mint for a coin of this caliber so I’m ok with it. Only thing I would have liked is knowing the exact mintage number. I am actually surprised that the US mint does not do this. Not only does it inform the consumer of when it was struck – by a specific dye – but it can also be a quality control measure for the mint if they receive returns – could have an issue with coins near the end of a run – better quality control measures for their next run. It IS a beauty, isn’t it? I don’t now nor have I ever dealt with graded coins so I will remain blissfully content with my boxed Mint version. That being said, it’s nice that you’re engaging in a literal “pass it forward” with your current mint edition; good for you! As to numbering individual coin containers and/or accompanying literature, from my decades in the manufacturing, distribution and logistics fields/businesses I can attest to the fact that any such enumerating and/or cataloging can be both a tedious and expensive process that might possibly or even perhaps likely require another price hike to compensate for the expense of the extra materials and additional labor required. Just a little thought I wanted to throw into the mix.